The funnel on this post is meant to stop squirrels from getting up to bird feeders at the top but as you can see it doesn't always work. This squirrel would simply leap from the ground and grab onto the post above the funnel and then hang on with one foot while reaching across to the feeder. He was out there for at least 10 minutes having his full. He won't go hungry! That fluff hanging above the squirrel is nesting material for the birds. That is soooo funny. I swear it's impossible to keep squirrels away from bird feed! Although I've heard of some gadgets that might work, but they probably figured that out at the last conference of North American Squirrels. Very cool photo, Pat! I was at Allan Gardens this week and saw a squirrel and thought, well he is very smart to make this her/his home, it would be nice and warm in the winter! That brought a smile to my face. He's resourceful and dexterous at the same time. Smart squirrel. And a great show to look at. LOL, what a sight! This is one determined squirrel. Nothing was going to stop him or her from eating. Thank you so much for linking up and sharing your post. Thank you for the comment and visit!! Happy Saturday, enjoy your day and weekend! 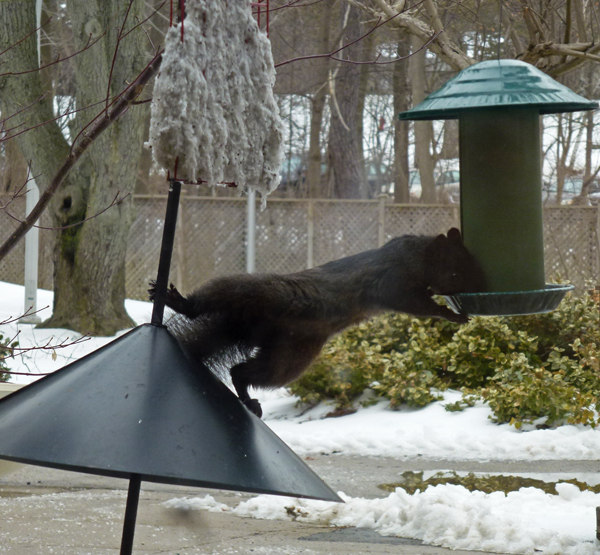 Good to see a smart, agile black squirrel doing well. Think bird feeders are a major source of food for them. I still remember my first time in Canada seeing the black squirrels! What a handsome guy/gal and a great snap indeed! Yup - sometimes none of them things work when the squirrels are determined. Ha ha! Squirrels are so determined. Ha ha, cool and funny shot, Pat ! If any critter does, it's squirrels that win it paws down, or paws up! Ha ha!! Those little imps are too darn smart! A friend once gave me a video which was a collection of squirrels outwitting every thing gardeners tried; didn't know whether to laugh or cry, because back then we had a yard with bird feeders and they were basically costing me a small fortune in black oil sunflower seeds!